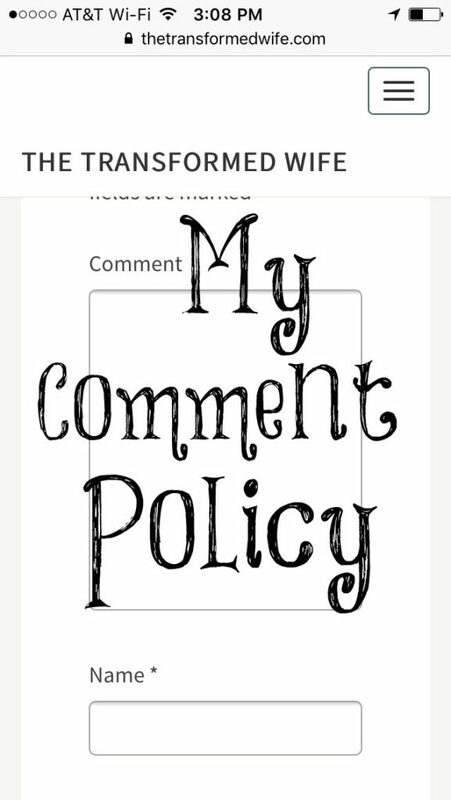 Normally, I don’t write posts on Saturday and Sunday but I felt compelled to write one today to explain my comment policy. I have done this in the past, but it needs to be explained again. My blog is a teaching blog. I am not going to publish comments that teach things that are contrary to what I teach. If you have an honest question, that is great, but I get comments that are longer than my post explaining why what I just wrote about is all wrong. I want you to know that I won’t publish this type of comment. I don’t agree with every single comment I publish but I will usually explain underneath it why I don’t or ask Ken to do it. Then I will allow other comments under it that explain their thoughts about it. Sometimes it’s good to have some of those who have a different viewpoint from me to see what the arguments for or against it are and always try to point to the truth of God’s Word. I try hard to only teach the truth of the Bible and from my experiences as being married over 36 years and raising four children to adulthood and now having grandchildren. No, I am not God nor do I claim to know everything perfectly but I share my views and interpretations of God’s Word concerning biblical womanhood, then you need to come to your own convictions. I am not going to water down the Word to fit with every exception. I will teach what God has commanded older women to teach and allow His Word to convict and challenge women’s thinking since His Word alone does not come back void. If you worked a long time on a long comment that directly contradicts what I have written, please expect that it won’t be published. If it is a cruel comment, I will either not publish it or edit it to take out the cruel words. I have this right since it’s my blog. Just as you wouldn’t like my dog pooping on your yard and leaving it there, I don’t allow others to poop all over my blog and Facebook page since it takes away and distracts from what I am trying to teach. If you don’t like what I teach, you don’t have to read it. Believe me, I don’t have much power to change anyone’s mind or actions. Only God has the power to do this and each individual as they have the freedom to obey His Word or not. And the servant of the Lord must not strive; but be gentle unto all men, apt to teach, patient, in meekness instructing those that oppose themselves; if God peradventure will give them repentance to the acknowledging of the truth. ***This verse is my goal. Do I do it perfectly? No, but I sure try and will always strive to do better. I like the fact you tell it like it is Lori! We are to be held to a different standard than most,I love the gentle rebuke of the word,when needed. Keep up the great posts that you always put forth. Thank you, Melinda! I sure will as long as the Lord wills. My posts are usually short but they are rarely posted. But it was deleted. Pretty much happens with every comment l make. Karen, it is because every comment you make on my blog is critical and this is why I don’t publish them and I even edited this comment. In answer to one of your comments, why shouldn’t men be able to comment on my blog? They fully know that this blog is for women and they like reading a blog that teaches women the ways of godly womanhood. They live with a wife, some have daughters, were raised by a woman, and deal with many women, plus they know how men think so we can learn a lot from them and their perspective. It can be good to know how men think in general, but it is important to remember knowing how your husband thinks is what really matters. Women need to learn her own husband’s mind and ways rather than focus on what specific men say they want. I too have transformed my thinking and worshipping and role fulfillment in our Lords kingdom over the last 4 years. I have been shown through diligent prayer and humble eyes what God says to me as a woman/wife/mother/sister/older woman in His kingdom. Our physical lives have changed greatly in that we were withdrawn from my our congregation for my daughters and my choice to be silent in worship and to not teach Gods word in a public setting. We have had our closest relationships turn from us, we’ve been labeled “lost and condemned” by many “Christians,” my husband was told by the 3 elders of that congregation that he was “leading his family straight to hell.” And yet through the simple desire to obey the Lord and His commands for us individually and collectively as a family, we have become closer to Him and have renewed desire to seek His word and obey it in its simplicity. I too have a blog site and a Facebook page entitled “his wife their mother” in which I use to write and reach out to sisters about our roles. They are beautiful and unique roles in which only we can fill. Thank you for your servants heart and for your writings. I will pray for you in your endeveaours. Thank you, Tressa, and may the Lord bless your good work! The narrow road can be a lonely road but this is the path we are called to take and there’s nothing better than the Lord’s ways.